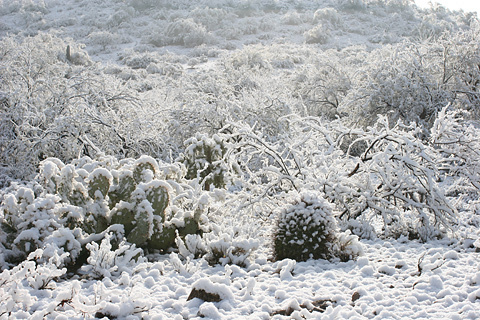 It snowed here in Tucson on the evening of January 21, 2007. 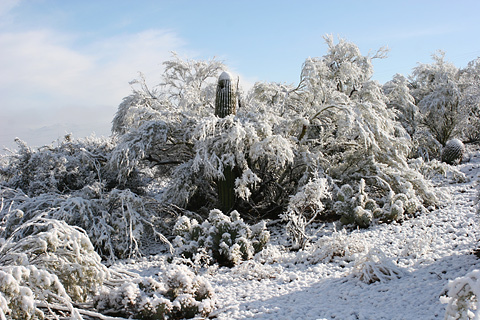 A cold winter rainstorm magically turned into a snowstorm, and fat, wet snowflakes covered our desert trees and cacti in white. I got about 1.5 inches (3.8 cm) of snow at my house. By morning, it was already melting, but it was still quite beautiful outside. 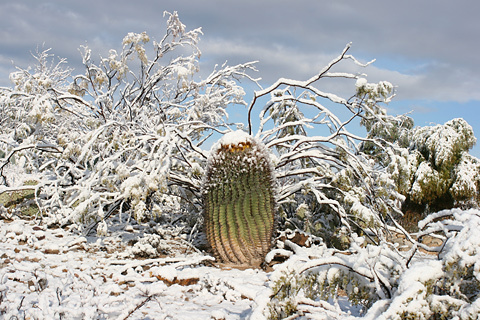 The snow-capped Saguaro (Carnegiea gigantea) above is still partly sheltered by its "nurse tree", a Yellow Paloverde (Parkinsonia microphylla) that shaded and protected it from our harsh climate while the Saguaro was young. 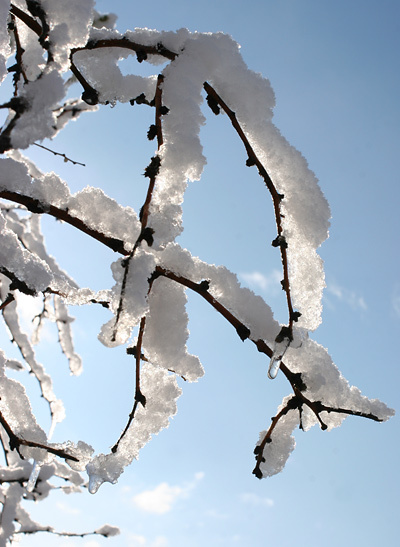 It was amazing to see our normally dull brown winter landscape turned to white overnight. 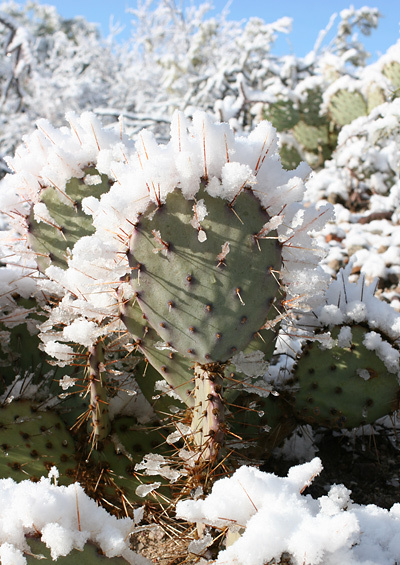 The flat stem pads of Cactus Apples or Engelmann's Pricklypears (Opuntia engelmannii) were each crowned with an icy crescent of wet snow. 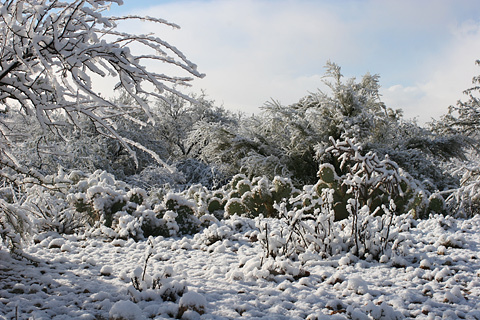 Because the storm was not windy and the snow was wet and sticky, even the slenderest of tree branches, such as those of this Velvet Mesquite (Prosopis velutina) above, had a thick icing of snow. 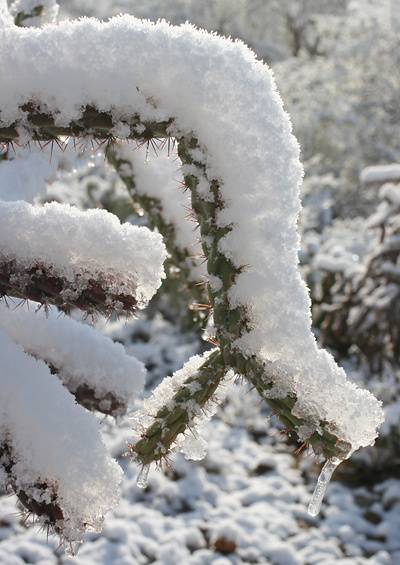 The spiny stems of Staghorn Chollas (Cylindropuntia versicolor) were covered in snow and tipped with dripping icicles. This defiant Candy Barrelcactus (Ferocactus wislizeni) above somehow resisted accumulating much snow, unlike the rest of its snowy white neighboring plants.